LIMITED EDITION DESIGN! The BUG-A-SALT CAMOFLY 2.0 is the most powerful, efficient BUG-A-SALT designed yet. 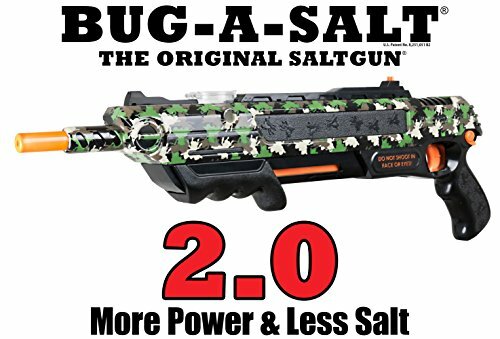 The Bug-A-Salt shoots a shotgun spray of regular table salt and decimates flies on contact. A surefire fun way to enjoy a disgusting task. Rid your house of all those pesky pests and have a blast while doing it. Includes 90 day warranty with proof of purchase. Features snazzy, hand-crafted, Camofly graphics. New, Improved, & Re-engineered 2.0 Model. Quick Action Safety for Increased Rate of Fire. 80 Shots of Salt Before Reloading. No Batteries Required. If you have any questions about this product by SKELL INC., contact us by completing and submitting the form below. If you are looking for a specif part number, please include it with your message.